The purpose of the Draft EIS is to present the existing environmental conditions, analyze the potential effects of the project, and identify ways to minimize potential adverse impacts. The Draft EIS also outlines the potential benefits of TMT to the local economy and community. The TMT project encompasses the construction, operation, and ultimate decommissioning of the world’s most advanced optical / infrared telescope. The plan proposes building TMT on the northern plateau of Maunakea at a location designated in the 2000 Mauna Kea Science Reserve Master Plan for the next generation of optical telescopes. This location was preferred because it provides suitable observation conditions with minimum impact on existing facilities, w?kiu bug habitat, archaeology/historic sites, and the view of the mountain from various areas on the island. The Draft EIS addresses the proposed TMT Observatory and associated facilities, including the mid-level facility at Hale P?haku, the headquarters in Hilo, and a potential satellite office in Waimea. The Draft EIS was prepared by Parsons Brinckerhoff. The University of Hawai‘i is the Proposing Agency for the Draft EIS. The Accepting Authority is the Governor for the State of Hawai‘i. The Draft EIS acknowledges that there are differences of opinions concerning TMT’s potential impact on cultural resources. Invasive Species Prevention and Control Program. The project’s objective is to advance human understanding and knowledge. The potential benefits of the proposed TMT project in Hawai‘i are primarily related to education and employment opportunities and direct contributions to the local and state economies. An estimated 140 full-time employees during TMT’s operations. A higher education and community benefit package to provide funding for (a) selected educational initiatives on the Island of Hawai‘i and observing time to UH astronomers; and (b) locally chosen and managed educational programs. The higher education and community benefit package would be negotiated and become part of a lease or sublease, if TMT decides to come to Hawai‘i. Details of the packages will be described in the Final EIS, provided an agreement is reached. To date, the Draft EIS process has included more than six months of research, environmental studies, public comments, and compliance with the requirements in the Comprehensive Management Plan for Maunakea. The process began in October 2008 with a series of public scoping meetings. Another series of public meetings to solicit comments on the Draft EIS is scheduled for mid-June at various locations on the Island of Hawai‘i and in Honolulu. The community has expressed great interest in TMT, in protecting the natural and cultural resources of the island and in developing a different basis for compensation such as higher education and community benefit packages. Comments generated by the Draft EIS will be incorporated into the Final EIS. The Draft EIS is the first step in the regulatory process. Subsequent milestones include the Final EIS and the submission of a Conservation District Use Application (CDUA) should Hawai‘i be selected as the preferred TMT site. The TMT project is a partnership among the California Institute of Technology, the University of California, and ACURA, an organization of Canadian universities. 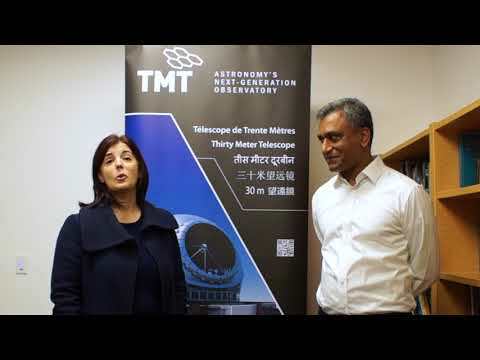 The National Astronomical Observatory of Japan has also joined TMT as a Collaborating Institution.